For a couple of years, I have been thinking about this twenty-fifth anniversary of the carnage of 1984. I have been fervently hoping that the Sikh community would wake up the world about the atrocities of that year in India, in fact the atrocities that seem to be a part of everyday life in that country, that legal fiction doomed ultimately to failure. I have been hoping we could awaken the masses of oppressed people especially in India and stir them to action. I have been looking forward to the chance of using this year as a springboard to accomplishment, a big step toward the establishment of our homeland from the rubble of what was India. Imagine what we could accomplish if the various oppressed groups who cope with discrimination on a daily basis - the Dalits, the Tribals, the Christians, the Muslims, the Hindu Widows...I could go on and on...and, of course us Sikhs - imagine that we all worked together to end the injustices meted out to us by the corrupt Republic of India. It almost boggles the mind. India will disintegrate one day. The only question is, how will Bharata Mata fall? Will it be peaceful, as in the old Soviet Union, or will it be by horrible bloodshed as it was at the time of Partition when the Raj was divided and our Punjab was torn into two bloody pieces? Time will tell. What I had not anticipated was the emotional toll that reliving, on a daily basis, the horrors of that time would have on me. Those events are so much a part of me, with me 24/7/365 that it is rather like being a woman; I am a woman, of course, it's always there, always a part of who I am, but I don't sit thinking about it all the time. I don't relive the oppression wrought upon my sisters throughout the ages, the oppression that continues even now, in both obvious and subtle ways. In the same way, I generally don't sit and relive all that happened. It's just there. Now, however, it has become very immediate to me. Looking at the old pictures, the candidacies of Tytler and Sajjan Kumar, remaking the pictures of the burnt Akal Takht, over and over, is taking its toll on me. I hope it doesn't show too much. And I most fervently hope that it will prove worth the effort and pain involved. I have great faith that the efforts of all of us survivors who have taken this burden on ourselves will be richly rewarded. And now, yet another petition, an important one from the good folks at the 1984 Accountability Project. This one calls for a full international investigation into the role of that rascal rajiv gandhi as well as the culpability of the congress party in the slaughter of Sikhs in November 1984. If you care about the sacrifices of our shaheeds at that time, as well as the well-being of us survivors, please take a minute to sign this petition. The November 1984 Accountability Project seeks to obtain justice for the thousands of innocent Sikhs who were murdered, tortured, raped, beaten, and burnt alive during the massacres in Delhi and throughout India in November, 1984. During this carnage, Sikhs were burnt alive with petroleum in the streets, women were gang raped, some by police, and infants were put to death. To date, the people responsible for organizing this carnage are yet to be brought to justice. We seek and an independent international inquiry into former Indian Prime Minister, Rajiv Gandhi's and the Congress party's role in planning, organizing and executing the November 1984 anti-Sikh pogroms in New Delhi, India and the immediate removal of Rajiv Gandhi's name from all public monuments, airports, roads, stadia, parks, sports awards, and professorships. Join the quest for justice. Sign the petition http://www.nov1984.org/petition/#Signdemanding justice for the victims of the 1984 pogroms. "The blackened, stiff corpses lay against the walls… with their eyes open. The burn victims were Sikhs, identifiable only by the steel bracelets worn on their wrists." "Like being a Jew in Czarist Russia or Nazi Germany" Violence makes Sikhs fear for their future in India." "When the history is written of the horrors that followed the assassination of Indira Gandhi, the 32nd block of Trilokpuri Colony will be remembered as a place where civilization disintegrated." and the immediate removal of the name of former Indian Prime Minister, Rajiv Gandhi, from all public monuments, airports, roads, stadia, parks, sports awards, and professorships. By conservative estimates, 4000 Sikhs were killed in the first week of November 1984 on the streets of India's capital. Organized armed groups, equipped with lists of Sikh households, overtook the city, as a curfew was imposed, and law enforcement was either absent or facilitated the atrocities. These organized massacres followed the assassination of Rajiv's mother, the Indian Prime Minister, Indira Gandhi, by two Sikh bodyguards, who were avenging the attacks against Sikh shrines in June, 1984. On June 4, 1984, a major Sikh religious holiday, Indira Gandhi had ordered Indian troops to storm the holiest of the Sikh gurdwaras, Darbar Sahib, and 31 other gurdwaras, resulting in the brutal deaths of thousands of innocent pilgrims. Rajiv had been sworn-in as the new Prime Minister immediately after the assassination, and very soon thereafter, the carnage against Sikhs ensued. For four days following this, Sikhs were killed with complete impunity in New Delhi under express orders from many prominent politicians such as H.K.L. Bhagat, Sajjan Kumar, and Jagdish Tytler – of Rajiv's political party. In the April 26th, 2009 edition of the Indian Express, an eye-witness quotes Tytler as telling a crowd, "I had assured you that you kill Sikhs and nothing will happen to you. I had given a promise to the Centre. Despite this, by killing least number of Sikhs, you have lowered my prestige." 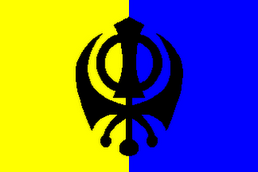 This on-the-spot involvement of high ranking party members, and inaction and worse on the part of the police, complete with names of perpetrators in many cases, was first documented by a group of human rights activists (all non-Sikh) in the report, "Who Are the Guilty?," within a month of this massacre. Shortly afterwards, Rajiv commented at a rally, "But, when a mighty tree falls, it is only natural that the earth around it does shake a little." Not only that, Rajiv promoted politician Bhagat to the rank of cabinet minister, and rewarded Tytler with an appointment as minister of state. The assiduous efforts made ever since then by the Indian state to shield the guilty of 1984 are now fully documented in the book, "When a Tree Shook Delhi," by Manoj Mitta and H. S. Phoolka. We submit that such an extensive and intensive cover-up, which still continues as the Indian Express article of April 26, 2009 cited above clearly shows, would have been impossible to initiate, and sustain for so long, unless Rajiv was deeply implicated in these mass murders from the very beginning. International criminal law recognizes the primacy of holding the one with the maximum responsibility most guilty in order to break cycles of impunity. "Command responsibility" holds a superior legally responsible for human rights violations by subordinates if the official knew or should have known about these violations but failed to prevent them or punish those who committed them. We therefore call for an inquiry into Rajiv Gandhi and the Congress party's responsibility for the November 1984 massacres. The dozen odd kangaroo courts and commissions set up by the Indian government over the past 25 years have served to do nothing more than insult the intelligence of the Sikh community in general, and the surviving relatives of the victims in particular, who still continue to suffer due to the carnage that was unleashed on the streets of Delhi. This partisan record of Indian courts and the inaction by the government in the past 25 years necessitates that such an inquiry be held by an international body, one that is acceptable to Sikhs world-wide. We also call for the immediate removal of Rajiv Gandhi's name from all buildings, awards, monuments, etc. This rampant and tasteless glorification of a very doubtful political character is a constant daily re-victimization of the Sikhs, and a reminder to them of the justice that has almost totally eluded them so far. That "history repeats itself" couldn't be more true than in the parallel between the Sikh massacres of 1984 under the Congress party leadership and the Muslim massacres of 2002 under the Bhartiya Janta Party leadership. Narendra Modi should similarly be indicted and tried for his instigation and planning of ostensible pogroms that left thousands of Muslims dead. We call for justice to all, regardless of which Indian party is in control, and regardless of the faith or class of the victims. 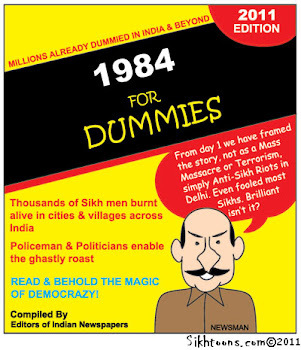 Rajiv Gandhi's heirs are deluding themselves if they think that they can make the Sikhs forget the facts about 1984. At the very least, they should have desisted from naming even small-town parks in the Punjab after him. Unless their objective in so doing was not to let the Sikhs forget 1984? For, they are only succeeding in constantly reminding the Sikhs of their humiliation, by confronting them, day in and day out, with the name, and often the picture, of the person whom the Sikhs hold the most culpable. If this is not the sign of breaking up, then what is?? India used to have 20 something states, now the figure is close to 30, how much further divisions can we have?? Isn't this a divide and rule policy which Britishers were known for? There is a terrible need to wash out these greedy politicians from India, adopt a new constitution where everyone is given equal right, justice is speedy and all the quotas and reservations are abolished.. I hope the petition does some good! Maninder Ji - I believe that the dissolution of India is inevitable. But I could be wrong. Lol, I often am. A constitution where all are equal is a great idea. However, unless the hearts of the majority can be changed, it would be nothing more than ink on paper. The four varnas, and, of course, the reality of the dalits, are deeply ingrained in thhe Indian psyche and will not easily be left behind - nor will the prejudice engendered by the caste system. IMO, the caste system is the root of India's problems - and it's not about to be rooted out. As for what will happen, we shall see.